Posted September 9, 2015 by Alannah Maher & filed under Arts & Entertainment, Exhibitions, Featured Arts & Entertainment. Contemporary art can often be rather ambiguous in nature. Indeed, much art exists purely “for arts sake”, but when it can be used as a medium to communicate, to explore and to push boundaries– it becomes something truly impactful. Currently showcasing at the UNSW Galleries, People Like Us is a varied and excellently curated collection of works exploring the interrelationships between art, technology and the human experience. Felicity Funner curates varied mediums of work including video, sound and sculptural installations. Interaction plays a key role in this exhibition, with the space living up to its reputation as being more of a “living creative laboratory” rather than a traditional exhibition space. These works vary in form and function, from George Poonkhin Khut’s Brighthearts app that invites you to control beautiful moving images through touch and control of your heartbeat (originally developed to calm children before surgeries) and a physical embodiment of the internet in Su-Mei Tse’s aurally immersive purring cat portraits. Two key interactive works are Veloscape, an installation by Laura Fisher and Volker Kuchelmeister that takes you on a self-guided virtual bike tour through Sydney; and Inside – Topologies of Stroke, John McGhee’s virtual reality animation work that invites the viewer to explore the inner world inside our brains. “[Veloscape is] part of a broader project around the emotions in cycling and how cyclists connect with public space in a unique way,” explained Laura. Video was a new format for her to tinker with, but with a background in both fine arts and sociology along with grounding in research around cycling culture, Laura’s expertise were an excellent match for the video art expertise of co-collaborator Volker. The Veloscape installation itself involves a stationary bicycle interacting with a large video screen, participants are invited to virtually “ride” the bike through the streets of Sydney in rush hour via a video recording that responds to the riders pedalling speed. This reactionary capability paired with the sheer clarity of the moving image creates a genuinely immersive experience, you might find yourself gasping as a bus brushes past. The integration of cyclists sharing Sydney’s roads has been a highly politicised debate surrounded by much hostility and anxiety. Laura says that this project aims to “create empathy” by giving people an experience of the physicality of being a cycling commuter. “The interesting thing for us is when you talk to people about why they choose to ride or choose not ride… its all about the body,” said Laura. Cyclists enjoy combining physical activity with their commute, whereas non-riders consider cycling dangerous or intimidating. “I think what bicycles can bring to a city is a more dynamic use of space– improvisation, unpredictable and serendipitous social encounters– in the politics around cycling [those factors] get overlooked,” explained Laura. “When you look at the cities that have made a change [such as Tokyo, Amsterdam]– there’s just a different energy in the streets… The way we address the mobility problem has cultural implications and it has social implications.” No matter what side of the debate you sit on, you can’t argue with the impressive architectural drama of virtually cycling over the ANZAC Bridge. From work that shows a different perspective to the subjective and cultural elements of shared space, to work that shows us previously unseen inner landscapes inside of the human body– this exhibition is a true integration of art, technology and science. John McGhee works with data to visualise the things we cannot see. Inside – Topologies of Stroke uses animation and virtual reality technology to blur the lines between data and artistic interpretation. 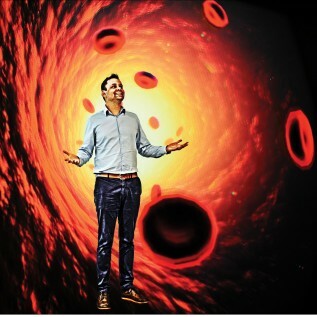 Visitors are invited to wear a virtual reality headset (an Occulus Rift DK2 headset, for those playing at home) and take a simulated tour through the arteries of the human brain, following the path of red blood cells through to the site of a stroke. This is an otherworldly experience influenced by pristine cinematic visuals, and an exciting use of VR technology in its early stages. The live feed from the headsets screening on monitors on the walls are fascinating, but no match to the immersive experience of navigating the tunnels of vessels for yourself. John trained as an industrial designer and moved into working on television commercials but soon “got bored of it” and developed an interest in “clever machines that allow us to see inside ourselves”. Admitting to not having much of an interest in science at school, he was gripped by technologies that change the way we visualise and communicate data. Stroke is one of the most expensive diseases in the Western health system, and from testing the VR technology with stroke patients John has deducted that it allows them, their partners and carers to gain a greater understanding of what has happened to them. “When it comes to rehabilitating people, you have a window of time to impact how people recover, and if we can use techniques like this to improve that, then that’s pretty cool,” he added. It is well worth setting aside an afternoon to spend drifting through and uncovering People Like Us. The theme of “the human experience” is one that could easily feel quite tired and regurgitated, but with its careful consideration of the capacities of new media and experimentation with new technologies, this exhibition is a stimulating testament to contemporary art that will have you feeling more like a participant than a spectator. Check out Streets of Papunya and the John Fries Award while you’re there.